This time I got a fabulous opportunity to start the year with some mountaineering enthusiasts in New Zealand. 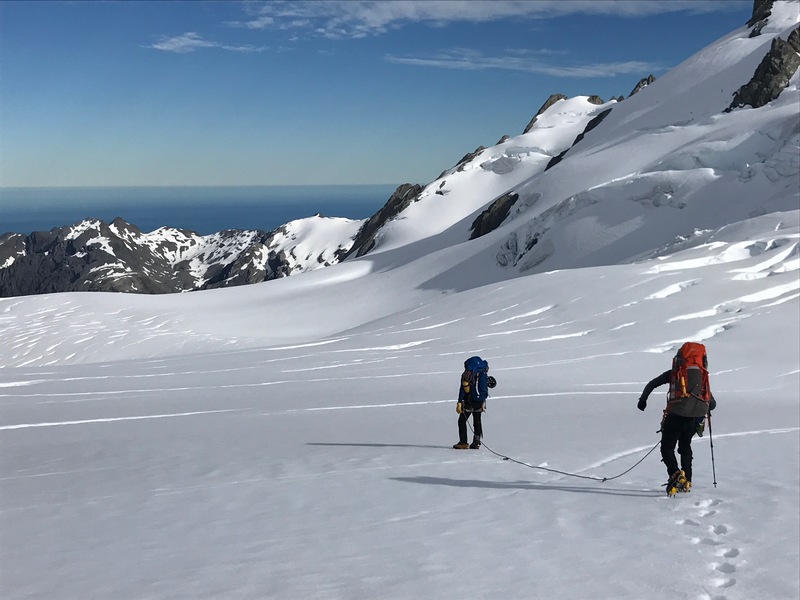 I was there to work with Adventure Consultants, a popular New Zealand based adventure company, for an eight-week long Mountain Guide training. This is not a story of some heroic feats or some record breaking moments, but I feel that the experience I gained there have made me a better being personally and professionally. My time in New Zealand was a mix of work, fun and travel. Though I was there as a part of my work which involved responsibilities, hard work and a bit of stress typical of any work; I also had beautiful memories with my friends, clients and the amazing landscape of New Zealand. I have known Adventure Consultants (AC) for many years, specially after I began to work in Everest Expeditions from 2003. During my work, I often used to see AC operations run in very professional way which is why I wanted to work with them one day. In 2015 while climbing Mount Aconcagua in Argentina with Fernando Grajales Expedition, a local expedition operator in Mendoza Argentina, I got a chance to guide AC team for the first time. Same year later, I met Guy Cotter, the owner of AC in Kathmandu and I shared my interest to work with them. Not long after in 2016, I received an email from him offering me a guiding opportunity for AC in New Zealand. As a young guide, it was obviously a great news for me, especially for two reasons. Firstly, it would give me an avenue to explore my professional area further as I could work on different mountains with different peoples. And New Zealand being the adventure capital of the world, always used to bear some sort of fancy for me. Next reason and the most important one is, such experience would prove to be really resourceful to enrich the professionalism of Nepali Guide community, where such opportunity is very scanty. So, there was lot of excitement for this particular trip. After arriving in New Zealand I got a big surprise when Guy Cotter and Suze Kelly came to airport in Queenstown to pick me up which I hadn’t expected. On my first day there was a familiarization visit to AC office. Guy and Suze invited me to stay at their beautiful house in Lake Hawea where I stayed throughout my time in NZ. The place offers one of the most stunning views of Lake Hawea and the surrounding mountains, which adds energy to my work in some ways. Once in New Zealand, I was immersed in work as anticipated. Guiding outside Nepal is much different from Nepal. And New Zealand was no exception to that. In Nepal, you enjoy the advantage of knowing the mountains. Logistic preparation is different as most of the time you have many hands but in place like New Zealand, you have to do most of things including the chores by yourself like driving, shopping, cooking apart from your core jobs like guiding and preparing. So you will not be a lazy guide! I spent the first few days with Guy, Suze, Anthea and Dean Staples doing rock climbing near Wanaka and Lake Hawea, two of the best spots for outdoor adventures in NZ. 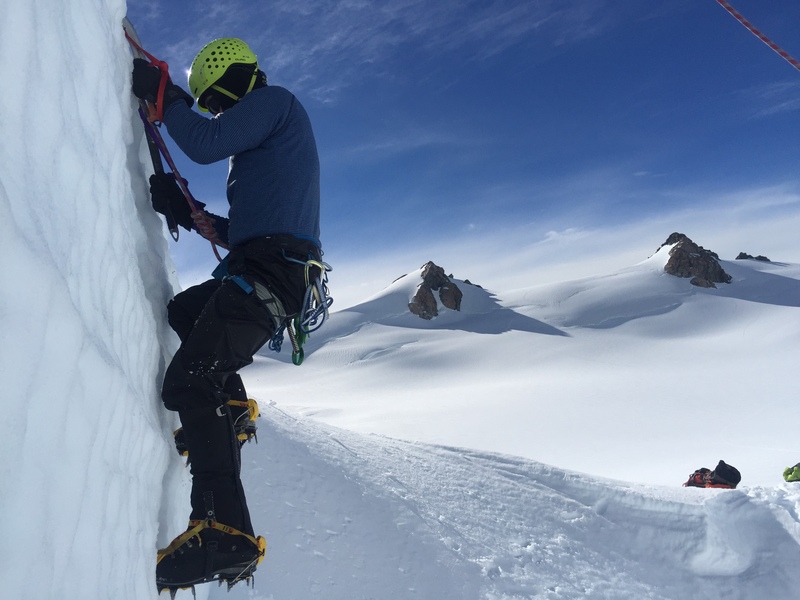 My first guiding trip was an instruction course called Mountaineering Instruction Course (MIC) to Grand Plateau in Mount Cook with another guide named James Hamilton, a very friendly and nice guy. We worked together along with other four members from Australia. Working with them was fun! However, it was not just the work relationship. Beside training we spent a memorable chunk of our time sharing our stories and knowledge. In the first few days, weather posed us a challenge. Suddenly, Nature had some whimsical ideas and started being so erratic. It was mostly very windy followed by snow and rain. And in such weather, clear skies were out of question! We were like some beginner Zen monks going through some patience-test sessions. However, we always found many options to keep ourselves busy like practicing knots and indoor climbing. My second trip was to Mount Aspiring with one member from Australia. As the weather was better, we spent one great week doing mountains training and climbing. But we couldn’t reach the summit of this mighty mountain because of bad weather once again. So, we spent two days inside the Hut, once again, practicing rope knots and rescue skills. My third trip, the Ascend Week, was at Fox Glaciers in the west coast. It was an amazing flight to Fox Glaciers as we flew near Mt Tasman the second highest mountain in NZ. In this trip, the guide was to choose the mountains depending on clients’ interest, level of fitness and experiences, something which needs meticulous speculation and analysis. 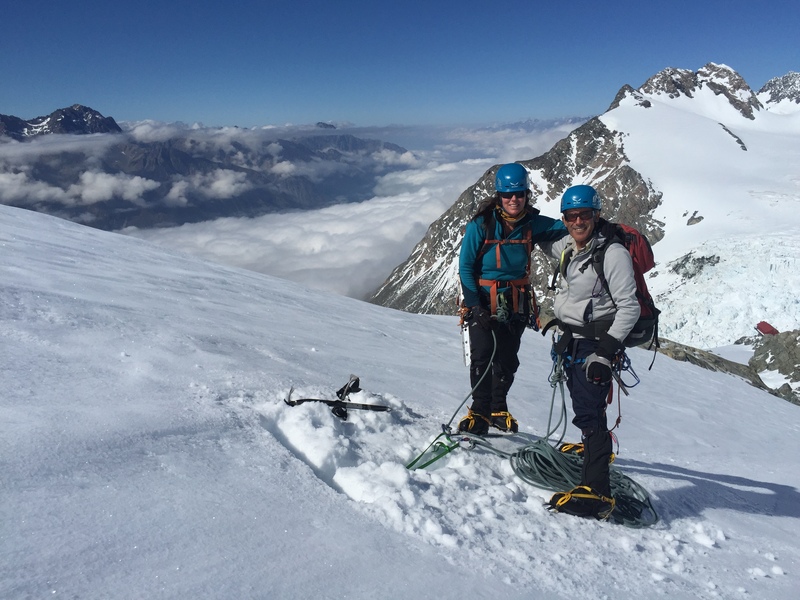 We climbed couples of summits and do lots of glacier walks. In this trip I was with another IFMGA certified Mountain Guide Mark Sedon the only person I could speak in some Nepali. It was such a relief! Everything was going great except for bad weather for some days once again. For three weeks in a row, we were disturbed by weather in some ways. That was a great lesson for us! How much we plan and prepare, we can never be 100% sure about Nature. Nature can be next to unpredictability. 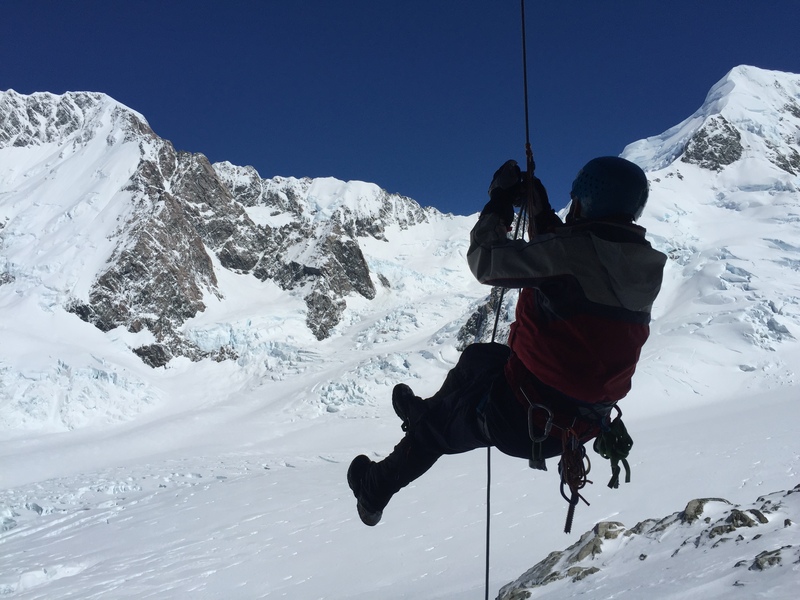 The last trip was again to Mount Cook region at Grand Plateau. There were four clients under my care for MIC. And finally, the weather turned out to be the most amazing one of the whole trip. Blue sky all night and day! It was like New Zealand was saying “we have amazing weather too, its just we feel like testing your patience!” It’s also another great lesson for us that life is not just about clouds and rain. There is always a bright sunshine at the end of the day! And obviously our training went well and we got to work all day long everyday. Everyone became happy with some feel of achievement. And everything for the season came to an end! Before flying back home, I had a visit to Queenstown and Auckland, two of the most iconic cities of NZ. It was a refreshing delight for me after weeks of work and exhaustion. Overall the whole trip was great making me a better guide than before. The best feeling was not at all the air of superiority I would get from training others. But the learning I got from the mountains of NZ and my other fellow guides. I got to know my areas of improvement and weaknesses. I improved my planning, cooking and shopping skills. I realized that I must learn driving which I surprisingly find much harder than guiding in mountains. I want to thank Adventure Consultants for this opportunity on behalf of Nepali Mountain Guide community. I appreciate their support and trust. I am really happy to be a part of this training and hope to work with AC again in future. I am equally amazed by the friendliness and helpfulness of NZ people. Especially I wouldn’t forget the moments I spent with my friend Dr. Jen in Queenstown and my cousin sisters in Auckland. As a guide it’s always very important to conclude the season with good experience and guiding, without any accidents and arguments; without any grudges and grievances. So, the trip was a success and something to remember for lifetime, especially when you are back home and lying on your bed with a sigh of relief. That is the main summit! All in all, it has been a great season! And I am sure it will take quite a while to get off the memories I had there.